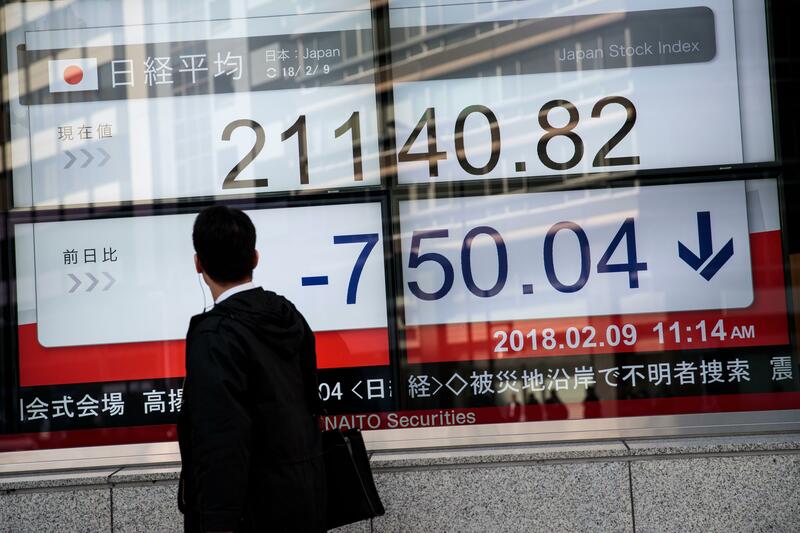 BEIJING -- Global stock prices sank Friday after the Dow Jones industrials on Wall Street plummeted more than 1,000 points, deepening a week-long sell-off. Markets followed U.S. stocks down after the Dow, coming off a record high, entered a correction - or a 10 percent decline from its latest peak - for the first time in two years. In early trading, France's CAC 40 lost 0.4 percent to 5,144.35, adding to Thursday's 2 percent decline, and London's FTSE 100 shed 0.3 percent on top of the previous day's 1.5 percent retreat. Germany's DAX was unchanged. Asian markets fell more sharply. The Shanghai Composite Index tumbled 5.5 percent before ending the day down 4 percent at 3,129.85. Tokyo's Nikkei 225 lost 2.3 percent to 21,382.62 and Hong Kong's Hang Seng retreated 3.1 percent to 29,507.63. On Wall Street, futures for the Dow and Standard & Poor's 500 index were up an unusually large 0.7 percent, suggesting traders might be trying to take advantage of lower prices to buy. Financial analysts regard corrections as a normal event but say the latest unusually abrupt plunge might have been triggered by a combination of events that rattled investors. Those include worries about a potential rise in U.S. inflation or interest rates and whether budget disputes in Washington might lead to another government shutdown. "Markets are down again today, maybe unnerved by fears that the U.S. Senate will not pass a budget bill in time to avoid a U.S. government shutdown," said Rob Carnell of ING in a report. "With financial markets vulnerable at the moment, this was not great timing for such political brinksmanship." Chinese markets fell despite unexpected strongly trade data Thursday. Elsewhere in Asia, Seoul's Kospi 1.8 percent to 2,363.77 and Sydney's S&P-ASX 200 lost 0.9 percent to 5,838.00. India's Sensex retreated 1.1 percent to 34,017.83 and benchmarks in New Zealand, Taiwan and Southeast Asia also fell. In Europe, markets were unnerved Thursday by the Bank of England's indication that it could raise its key interest rate in coming months due to stronger global economic growth. The S&P 500, the benchmark for many index funds, shed 100.66 points, or 3.8 percent, to 2,581. Even after this week's losses, the S&P is up 12.5 percent over the past year. The Nasdaq composite fell 274.82 points, or 3.9 percent, to 6,777.16. In currency markets, the dollar edged up to 109.18 yen from Thursday's 108.73 yen. The euro gained to $1.2270 from $1.2248. Benchmark U.S. crude lost 64 cents to $60.51 per barrel in electronic trading on the New York Mercantile Exchange. It fell 64 cents the previous session to $61.15. Brent crude, used to price international oils, lost 51 cents to $64.33 in London. It retreated 70 cents on Thursday to $68.81.